A really nice and quiet place that we could call second home. Warmy and pleasant house as well as lovely decorated and coordinated . We definitely recommend this property for your next holidays. We really enjoyed Ile de Re but were a little disappointed with the property. The photos are representative but we just felt it was a bit tired and musty, and in need of some more cleaning. There were a few cobwebs and spiders around! Some of the lights didn't work, including the outside one. We only seemed to have been given one black bin bag for rubbish which soon filled up. Some more storage space in the bedrooms would have been useful e.g. chest of drawers. We didn't realise the two bedrooms are connected which may not suit everyone - to get from the master bedroom into the living area you have to walk through the second bedroom. We hired linen and were disappointed with the quality provided. One thin pillow each would not be sufficient for some people. We appreciated having our own outdoor space and a parking space. The property is in a good location, five minutes walk into the town and two minutes from a bus stop. The two main supermarkets are just a few minutes away by car. The owners were very helpful in booking the property but the property manager was slow to respond to emails and texts. Very pleasant / comfortable house in a quiet area but still close to the port, shops and supermarkets. Also the local management agent is absolutely first class. 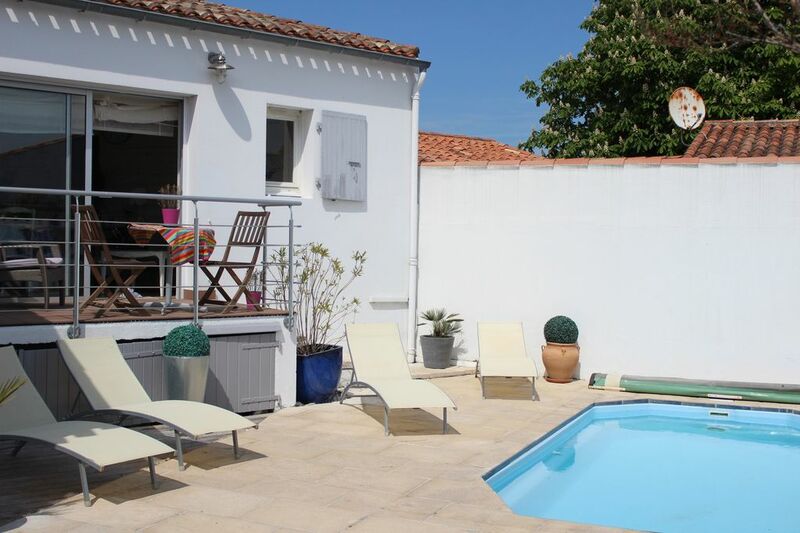 A charming house located in a quiet area of St Martin de Re close to all amenities. Tastefully decorated, well-maintained and fully equipped with everything you need. The house has a great little pool and two great sun terraces – one for lunch and one for dinner! The owners are incredibly helpful and use a concierge service to maintain the property and for you to use as a point of contact when you are there. This was our second stay at the property and I think we enjoyed ourselves even more this time. Ile de Re is simply idyllic and this is the perfect base to explore St Martin de Re and the rest of island. Je suis très touchée par ces commentaires. Mme CLaire G. venait avec sa famille pour la 2eme fois et nous étions heureux de l'accueillir dans cette petite maison qui est vraiment proche du port et en même temps très calme. Il est vrai qu'une petite maison avec piscine privée dans ST MARTIN est très rare. Nous acceuillons toujours (par l'intermédiaire de notre prestataire sur place) nos locataires comme s'ils étaient nos propres hôtes. Notre priorité est le bien être de nos vacanciers.